The weather in Paris was unusually warm as Peter Haskell’s plane landed at Charles de Gaulle Airport. The plane taxied neatly to the gate, and a few minutes later, briefcase in hand, Peter was striding through the airport. He was almost smiling as he got on the customs line, despite the heat of the day and the number of people crowding ahead of him in line. Peter Haskell loved Paris. He generally traveled to Europe four or five times a year. The pharmaceutical empire he ran had research centers in Germany, Switzerland, and France, and huge laboratories and factories in England. It was always interesting coming over here, exchanging ideas with their research teams, and exploring new avenues of marketing, which was his real forte. But this time it was far more than that, far more than just a research trip, or the unveiling of a new product. He was here for the birth of “his baby.” Vicotec. His life’s dream. Vicotec was going to change the lives and the outlook of all people with cancer. It was going to dramatically alter maintenance programs, and the very nature of chemotherapy the world over. It would be Peter’s one major contribution to the human race. For the past four years, other than his family, it was what he had lived for. And undeniably, it was going to make Wilson-Donovan millions. More than that, obviously, their studies had already projected earnings in the first five years to well over a billion dollars. But that wasn’t the point for Peter. The point was life, and the quality of those lives, severely dimmed, they were flickering candles in the dark night of cancer. And Vicotec was going to help them. At first, it had seemed like an idealistic dream, but now they were just inches from final victory, and it gave Peter a thrill every time he thought of what was about to happen. And so far, their most recent results had been perfect. Their meetings in Germany and Switzerland had gone brilliantly. The testing done in their laboratories there was even more rigorous than what had been done in the States. They were sure now. It was safe. They could move ahead to Phase One Human Trials, as soon as the FDA approved it, which meant giving low doses of the medication to a select number of willing, well-informed subjects, and seeing how they fared. Wilson-Donovan had already submitted their application to the FDA in January, months before, and based on the information they were developing now, they were going to ask for Vicotec to be put on the “Fast Track,” pressing ahead with human trials of the drug, and eventually early release, once the FDA saw how safe it was and Wilson-Donovan proved it to them. The”Fast Track” process was used in order to speed the various steps toward approval, in the case of drugs to be used in life-threatening diseases. Once they got approval from the FDA, they were going to start with a group of one hundred people who would sign informed consent agreements, acknowledging the potential dangers of the treatment. They were all so desperately ill, it would be their only hope, and they knew it. The people who signed up for experiments like this were grateful for any help available to them. Wilson-Donovan wanted to move ahead as quickly as possible to clinical trials on patients, which was why it was so important to test Vicotec’s safety now before the FDA hearings in September, which would hopefully put it on the “Fast Track.” Peter was absolutely sure that the testing being concluded by Paul-Louis Suchard, the head of the laboratory in Paris, would only confirm the good news he had just been given in Geneva. “Holiday or business, monsieur?” The customs officer looked unconcerned as he stamped Peter’s passport, and barely glanced up at him after looking at the picture. He had blue eyes and dark hair and looked younger than his forty-four years. He had fine features, he was tall, and most people would have agreed that he was handsome. “Business,” he said almost proudly. Vicotec. Victory. Salvation for every human being struggling with the agonies of chemotherapy and cancer. The agent handed Peter his passport, and Peter picked up his bag and walked outside to find a taxi. It was a gloriously sunny June day, and with nothing left to do in Geneva, Peter had come to Paris a day early. He loved it here, and it would be easy to find something to do, even if it was just a long walk along the Seine. Or maybe Suchard would agree to meet him sooner than he’d planned, even though it was Sunday. It was still early in the day, and he hadn’t had time to call Suchard yet. Although Suchard was very French, very serious, and more than a little rigid, Peter was going to call from the hotel and see if he was free, and willing to change their meeting. Peter had learned to speak some French over the years, although he conducted all of his business with Suchard in English. Peter Haskell had learned a lot of things since he left the Midwest. It was obvious, even to the customs man at Charles de Gaulle, that Peter Haskell was an important man, of considerable intelligence and sophistication. He was cool and smooth and strong, and had an air of assurance about him. At forty-four, he was the president of one of the largest pharmaceutical companies in the world. He was not a scientist, but a marketing man, as was Frank Donovan, the chairman. And somewhat coincidentally, eighteen years before, Peter Haskell had married Frank’s daughter. It hadn’t been a “smart move” on his part, or a calculated one. In Peter’s eyes, it had been an accident, a quirk of fate, and one which he had fought against for the first six years he knew her. Peter didn’t want to marry Kate Donovan. He didn’t even know who she was when they met, when she was nineteen and he was twenty, at the University of Michigan. At first, she was just a pretty blonde sophomore he met at a mixer, but after two dates, he was crazy about her. They’d been going out for five months before someone made a crack, and suggested that he was a hell of a smart guy for going out with pretty little Katie. And then he’d explained it. She was the sole heiress to the Wilson-Donovan fortune, the biggest pharmaceutical firm in the country. Peter had been incensed, and he had raged at Katie for not telling him, with all the furor and na´vetÚ of a boy of twenty. “How could you? Why didn’t you tell me?” He stormed at her. “Tell you what? Was I supposed to warn you who my father was? I didn’t think you’d care.” She’d been desperately hurt by his attack, and more than a little frightened he’d leave her. She knew how proud he was, and how poor his parents were. He had told her that only that year they’d finally bought the dairy farm where his father had worked all his life. It was mortgaged to the hilt, and Peter was constantly worried that the business would fail, and he’d have to give up school and go home to Wisconsin to help them. “You knew perfectly well I’d ‘care.’ What am I supposed to do now?” He knew better than anyone that he couldn’t compete in her world, that he didn’t belong there, and never would, and Katie could never live on a farm in Wisconsin. She had seen too much of the world, and she was far too sophisticated even if she didn’t seem to know it. The real trouble was that he felt he didn’t belong in his own world most of the time either. No matter how hard he tried to be “one of them” back home, there was always something different and much more big city about him. He had hated living on a farm when he was a kid, and dreamed of going to Chicago or New York, and being part of the business world. He hated milking cows, and stacking bales of hay, and endlessly cleaning manure out of the stables. For years, after school, he had helped his father at the dairy farm he ran, and now his father owned it. And Peter knew what that would mean. Eventually, he would have to go home, when he finished college, and help them. He dreaded it, but he wasn’t looking for an easy out. He believed in doing what you were supposed to do, in living up to your responsibilities, and not trying to take any shortcuts. He had always been a good boy, his mother said, even if it meant doing things the hard way. He was willing to work for everything he wanted. But once Peter knew who Katie was, being involved with her seemed wrong to him. No matter how sincere he was, it looked like an easy way out, a quick trip to the top, a shortcut. No matter how pretty she was, or how in love with her he thought he might have been, he knew he couldn’t do anything about it. He was so adamant about not taking advantage of her that they broke up about two weeks after he found out who she was, and nothing she said to him changed that. She was distraught, and he was far more upset over losing her than he ever told her. It was his junior year, and in June he went home to help his father in Wisconsin. And by the end of the summer, he decided to take a year off to help him get the business off the ground. They’d had a hard winter the year before, and Peter thought he could turn it around, with some new ideas and new plans he’d learned in college. He could have too, except that he got drafted and sent to Vietnam. He spent a year close to Da Nang, and when he re-upped for a second tour, they sent him to work for Intelligence in Saigon. It was a confusing time for him. He was twenty-two years old when he left Vietnam, and he had found none of the answers he wanted. He didn’t know what to do with the rest of his life, he didn’t want to go back to work on his father’s farm, but he thought he should. His mother had died while he was in Vietnam, and he knew how hard that had been for his father. He had another year of college left to do, but he didn’t want to go back to the University of Michigan again, he somehow felt he had outgrown it. And he was confused about Vietnam too. The country he had wanted to hate, that had so tormented him, he had come to love instead, and he was actually sorry when he left it. He had a couple of minor romances there, mostly with American military personnel, and one very beautiful young Vietnamese girl, but everything was so complicated, and relationships were inevitably affected by the fact that no one expected to live much past tomorrow. He had never contacted Katie Donovan again, though he’d had a Christmas card from her that had been forwarded to him from Wisconsin. He had thought about her a lot at first in Da Nang, but it just seemed simpler not to write her. What could he possibly say to her? Sorry you’re so rich and I’m so poor . . . have a great life in Connecticut, I’m going to be shoveling manure in a dairy farm for the rest of my life . . . see ya. . . . But as soon as he got back, it was obvious to all of them in Wisconsin that once again he just didn’t fit, and even his father urged him to look for a job in Chicago. He found one easily in a marketing firm, went to school at night, got his degree, and had just started his first job when he went to a party given by an old friend from Michigan, and ran into Katie. She had transferred and was living in Chicago by then too, and she was about to graduate from Northwestern. The first time he saw her again, she took his breath away. She was prettier than ever. It had been almost three years since he’d seen her. And it stunned him to realize that even after three years of forcing himself to stay away from her, seeing her could still make everything inside him tremble. “What are you doing here?” he asked nervously, as though she were only supposed to exist in his memories of his school days. She had haunted him for months after he left college, and especially when he first went into the service. But he had long since relegated her to the past, and expected her to stay there. Seeing her suddenly catapulted her right back into the present. “I’m finishing school,” she said, holding her breath as she looked at him. He seemed taller and thinner, his eyes were bluer and his hair even darker than she remembered. Everything about him seemed sharper and more exciting than her endless memories of him. She had never forgotten. He was the only man who had ever walked away from her, because of who she was, and what he thought he could never give her. “I hear you were in Vietnam,” she said softly, and he nodded. “It must have been awful.” She was so afraid to scare him away again, to make some terrible wrong move. She knew how proud he was, and just looking at him, she knew that he would never come near her. And he watched her too. He was wondering what she had become, and what she wanted from him. But she seemed so innocent to him, and fairly harmless, despite her seemingly ominous background, and the threat he had convinced himself she presented. In his eyes, she had been a threat to his integrity, and an untenable link between a past he could no longer live, and a future he wanted, but had no idea how to accomplish. Having seen so much more of the world since they had last met, looking at her now, he could barely remember what he had once been so afraid of. She didn’t seem so daunting to him now, she seemed very young, and very naive, and irresistibly attractive. They talked for hours that night, and he took her home eventually. And then, although he knew he shouldn’t have, he called her. It seemed so easy at first, he even told himself they could just be friends, which neither of them believed. But all he knew was that he wanted to be near her. She was bright and fun, and she understood the crazy things he felt, about how he didn’t fit anywhere, and what he wanted to do with his life. Eventually, far, far down the road, he wanted to change the world, or at the very least make a difference. She was the only person in his life then who understood that. He had had so many dreams back then, so many good intentions. And now, twenty years later, Vicotec was bringing all those old dreams to fruition. Peter Haskell hailed a cab at Charles de Gaulle, and the driver put his bag in the trunk, and nodded when Peter told him where he was going. Everything about Peter Haskell suggested that he was a man in command, a man of impressive stature. And yet, if you looked in his eyes, you saw kindness, and strength, integrity, a warm heart, and a sense of humor. There was more to Peter Haskell than just well-tailored suits, the starched white shirt and HermÞs tie he wore, and the expensive briefcase. “Hot, isn’t it?” Peter asked on the way into town, and the driver nodded. He could hear from the accent in his French that he was American, but he spoke it adequately, and the driver answered him in French, speaking slowly, so Peter could understand him. “It’s been nice for a week. Did you come from America?” the driver asked with interest. People responded to Peter that way, they were drawn to him, even if they normally wouldn’t have been. But the fact that he spoke French to him impressed the driver. 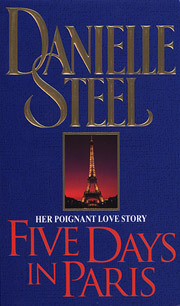 Excerpted from Five Days in Paris by Danielle Steel Copyright © 1997 by Danielle Steel. Excerpted by permission of Dell, a division of Random House, Inc. All rights reserved. No part of this excerpt may be reproduced or reprinted without permission in writing from the publisher.